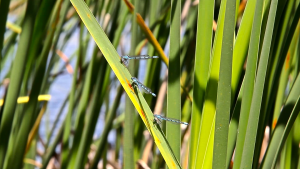 “I can remember planting corn and beans here,” landowner and Wisconsin Wetlands Association member Paul Becker says, standing at the edge of a wetland where dragonflies and birds now fly. These wetlands, part of Becker’s family property in northeast Wisconsin, have been restored and, for the past 20 years, have provided the Becker family with great hunting and recreational opportunities and improved water quality. And of course, these wetlands now provide important habitat for wildlife. Historically, 30% of Wisconsin’s land cover was wetlands. After decades of land use changes including development and farming, our state has lost half its wetlands. Of the acreage that remains, 75% is in private hands, giving Wisconsin landowners a vital opportunity to protect wetlands. For some landowners, protecting wetlands means managing currently existing ecosystems for invasive species or thinking carefully about where to place new buildings. For others, protecting wetlands means restoring them: bringing back the ecosystems that had been drained and converted. Becker is the seventh generation to live on his family’s property in Two Rivers, a town on the coast of Lake Michigan in Manitowoc County. His family had farmed their property for decades, growing crops and raising cattle and even running their own on-property slaughterhouse. In his own career, Becker has expanded his family’s agricultural tradition with his food service business, Riverside Foods. 75% of Wisconsin’s wildlife depend on wetlands at some point in their life cycle. With his new business and his siblings’ choices to pursue careers other than agriculture, Becker knew continuing the family farm wasn’t in his future. In the 1990s, he started looking into other options for his family’s property and heard about programs that supported wetland restoration and conservation. “My folks were approaching retirement age, so when some of these programs came up, I went to the farmhouse and said, ‘There’s a way you can take the land out of production, get paid, and still live on it. Let’s take a look at this,’” Becker said. In 1996, after family conversations and deliberation, Becker and two co-landowners, Fred Giesler and William Albrecht, put 172 acres of land into the Wetland Reserve Easement program (WRE, formerly known as Wetland Reserve Program or WRP). Easements are legal agreements to preserve land that may include technical and financial support. Easements like Becker’s are one of many options for private landowners seeking support for wetland restoration and management projects. Though every wetland restoration project is unique, restoration of previously farmed land often means removing drainage tiles buried underground. Tiling, once heavily promoted throughout the Midwest, is an agricultural land management technique that drains wetlands to create farmland. Restoring the Beckers’ wetlands meant removing five generations of tile, including hand-made clay tiles marked with fingerprints of previous Becker generations: their property was the first registered as tiled farmland in the county. Taking out these tiles was a reversal of family history, but a return to history for the landscape. Three generations of Beckers hunting their restored wetland. In the years Becker has been protecting his wetlands, his family has enjoyed the hunting benefits of having wetlands on their property. 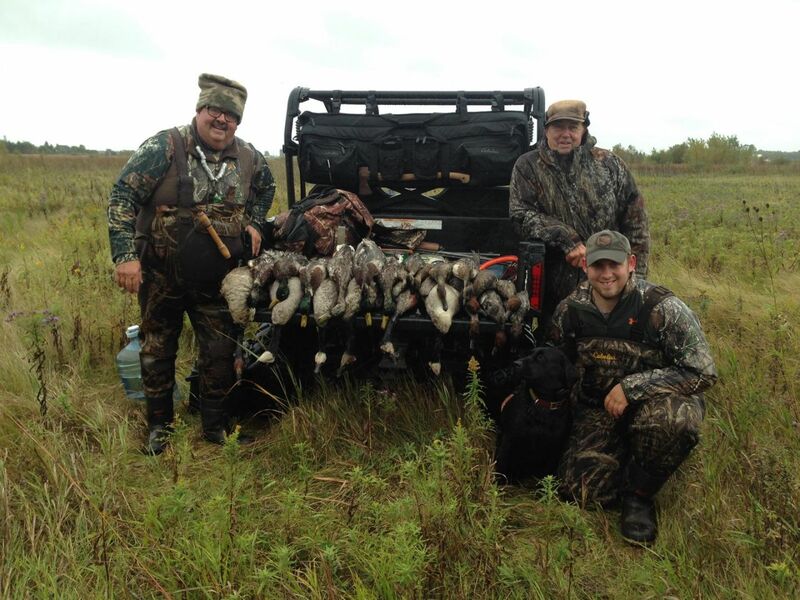 He and his family regularly reach duck harvest limits on the season’s opening day. Deer hunting has also been very successful. “This has turned into trophy deer hunting,“ Becker said. Since these restored wetlands are located near his family’s home, Becker can also take family members hunting who would not be able to travel far to hunt. “My father doesn’t get around so well anymore, but because of what we have here, we can take him out and still go hunting,” Becker said. 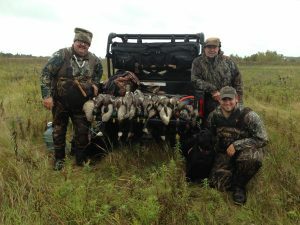 Improved hunting is only one of the benefits Becker has seen to his property. “The restoration started for the ducks. Then it became about the other birds: plovers, ibises, sandhill cranes, curlews, hawks, and osprey. There’s more wildlife in an acre of wetland than anything else in the world,” Becker said. 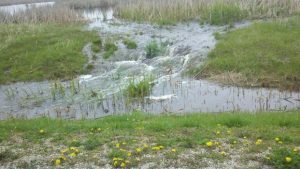 On one stormy day, Becker’s wetlands proved their benefit to water quality. On the right is run-off from his wetlands, on the left is run-off from farmland across the road. The restored wetlands have also improved water quality, a benefit that is easy to see in run-off during heavy storms. 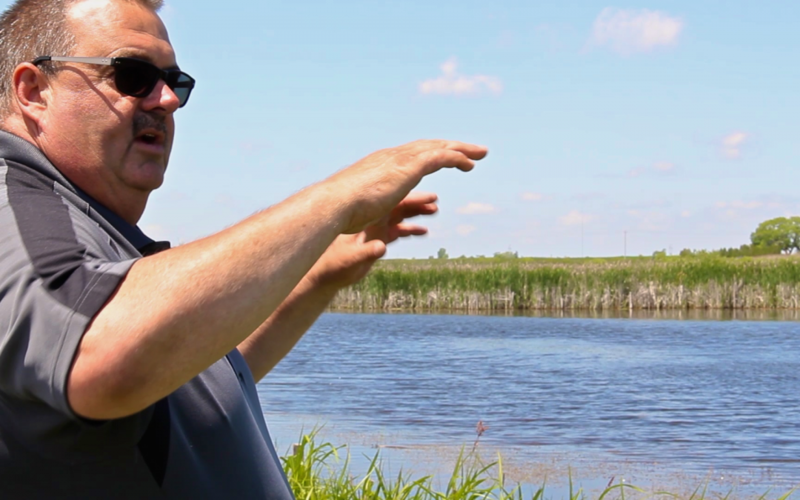 Since restoring his wetlands, Becker regularly answers questions for local landowners interested in starting similar projects. He’s passionate about his wetlands, and for good reason. Restoring and managing wetlands can present unique challenges, and Wisconsin Wetlands Association is here to help. If you’re interested in learning more about our resources for landowners, check out the sidebar at the right or give us a call at (608) 250-9971.